First, install and load ape (Paradis et al., 2004), TreeSim (Stadler, 2011), geiger (Harmon et al., 2008), diversitree (FitzJohn 2012) and hisse (Beaulieu & O’Meara, 2016). 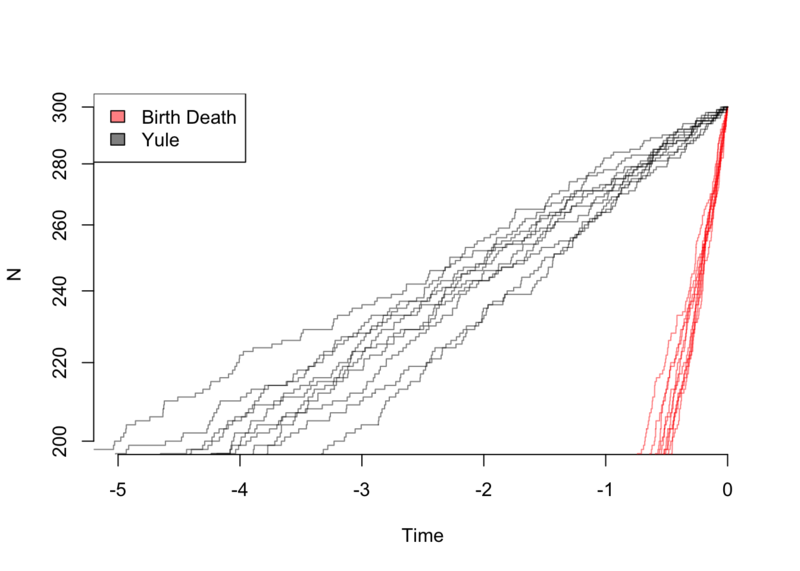 One way to look at trees, and actually what many methods reduce to under the hood, is lineage through time plots. We can also look at trees with birth and death. 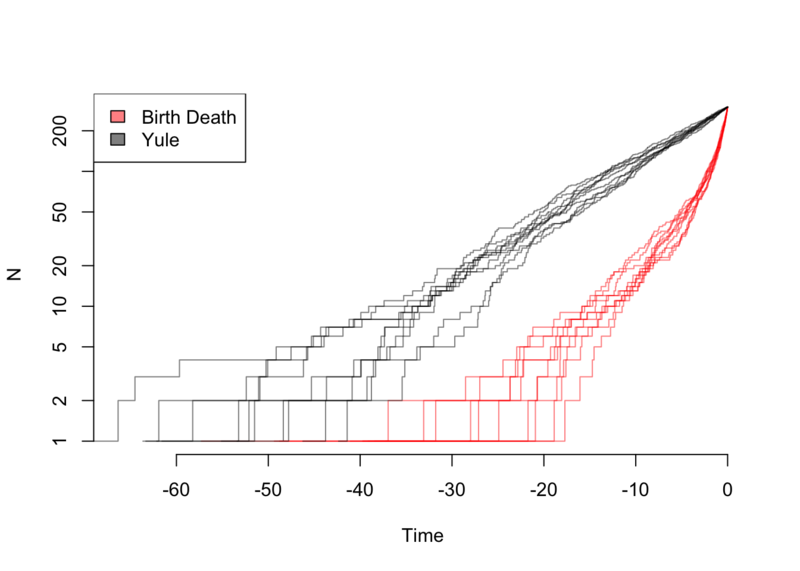 So even though the the net diversification rate is the same, there are very different patterns: in theory, one can estimate both birth and death rates from these trees. In practice, of course, with rates that change over time due to mass extinctions or trait evolution, missing taxa, etc. it can practically be hard to tell these apart. 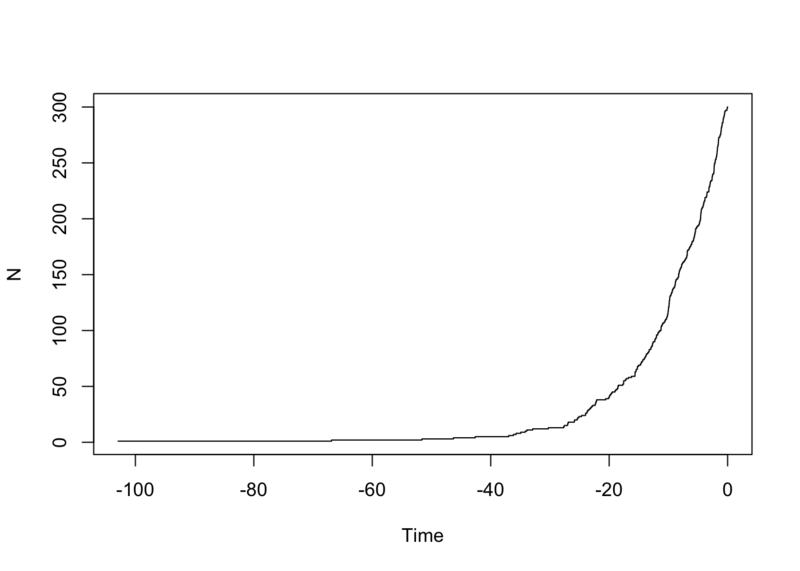 Once you can see that there is some information in the distribution of branch lengths, you can (and people have) make multiple models and compare them: a model where diversification rate slows or speeds up over time generates different predictions from a model where it’s constant, for example. There are a wide bestiary of models to compare: models that imply logistic growth to a maximum number of species (“Let’s speciate due to the Rockies!” “Wait, we can’t: there are too many species of us in China, we’re full!”), species age (“I haven’t speciated in a while – I forget how”), mass extinctions (“Incoming rock!! !”), and more. It’s important to remember the idea of dull hypothesis testing: if you’re comparing a complex model versus a simple model, on a messy, real dataset, you’re probably going to reject a simple model, even if the complex model isn’t true. It’s also worth looking at parameter estimates: if you find your group is undergoing logistic growth, what is the carrying capacity? If it’s a group of 26 species, and the carrying capacity is 27, that’s very different from finding a carrying capacity of 5000. The effect of missing species can also be significant (simulation to test for this effect can be important). There are also methods, like Medusa (Alfaro et al., 2009) and BAMM ([Rabosky, 2014[(http://journals.plos.org/plosone/article?id=10.1371/journal.pone.0089543)) that attempt to infer where on a tree diversification rate shifts have happened, though I’d currently (March 2017) caution against their use as the basis for a study (but using them to complement results gotten another way could be informative). An important point to remember about trait-based diversification models is that the tree and characters together are a result of the model. Thus, for example, if one wanted to test a null model for a trait having no effect on diversification, simulating trait evolution on an empirical tree is a bad idea: even though the trait data were evolved under a model with no differential diversification, there’s no guarantee that the empirical tree was (there are certainly traits that could have affected rates, rates can change through time at mass extinctions, etc.). See more discussion of this in Beaulieu & O’Meara, (2016). So to understand diversification, we’re going to have to look at the tree and traits jointly. This exercise is partially based on the HiSSE vignette by Jeremy Beaulieu. HiSSE is not the only method in this space; I focus on it here as an example approach. Rather than optimizing \(\lambda_i\) and \(\mu_i\) separately, hisse optimizes transformations of these variables. Here we let \(\tau_i = \lambda_i+\mu_i\) define “net turnover”, and we let \(\epsilon_i = \mu_i / \lambda_i\) define the “extinction fraction”. This reparameterization alleviates problems associated with over-fitting when \(\lambda_i\) and \(\mu_i\) are highly correlated, but both matter in explaining the diversity pattern (see discussion of this issue in Beaulieu and O’Meara 2016). The number of free parameters in the model for both net turnover and extinction fraction are specified as index vectors provided to the function call. Each vector contains four entries that correspond to rates associated with the observed states (0 or 1) and the hidden states (A or B). They are ordered as follows: 0A, 1A, 0B, 1B. Note that the index vector can also be set up such that parameters are linked among states or even dropped from the model entirely. Fairly straightforward, but why do we do it this way? This particular format makes it easier to generate a large set of nested models to test. We now include an internal function GetAllModels.anc() that provides all possible combinations of free parameters nested within the full hisse model. The transition rate matrix is set up separate from the diversification rate parameters. This was intentional. We want to reinforce the idea that SSE models are not trait evolution models, but rather joint models for the tree and the evolution of a trait. It for this reason that we depict the transition rates in the canonical Q matrix format. Recently Rabosky and Goldberg (2015) raised a very important concern with SSE models. They showed, rather convincingly, that if the tree evolved under a heterogeneous branching process that is completely independent from the evolution of the focal character, SSE models will almost always return high support for a model of trait-dependent diversification. From an interpretational stand point, this is troubling. But, it is important to bear in mind what such a result is really saying: Yes, BiSSE is very wrong in assigning rate differences to a neutral trait, but a simple equal rates diversification model is not correct either. This leaves practitioners in quite the bind, because the “right” model isn’t something that can be tested in BiSSE. This touches on a much larger issue, which is that we’ve relied on rather trivial “null”" models (i.e., equal rates diversification) to compare against models of trait dependent diversification. 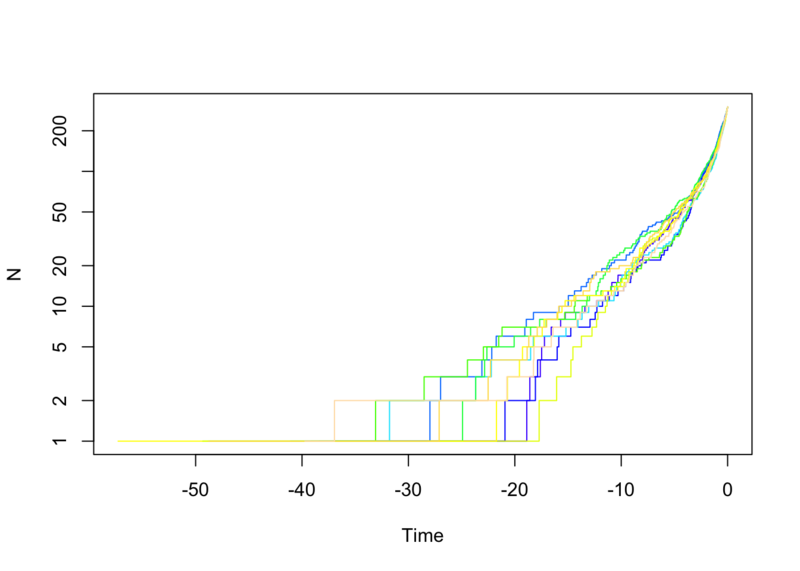 Again, it is important to stress that SSE models are not models of trait evolution, but rather joint models for the tree and the trait where they are maximizing the probability of the observed states at the tips and the observed tree, given the model. So, if a tree violates a single regime birth-death model due to any number of causes, then even if the tip data are perfectly consistent with a simple model, the tip data plus the tree are not. In such cases, then, it should not be surprising that a more complex model will tend to be chosen over a nested simpler model, particularly if the underlying tree is large enough. A fairer comparison would need to involve some sort of “null” model that contains the same degree of complexity in terms of numbers of parameters for diversification, but is also independent of the evolution of the focal character, to allow for comparisons among any complex, trait-dependent models of interest. In Beaulieu and O’Meara (2016), we proposed two such models. These character-independent (CID) models explicitly assume that the evolution of a binary character is independent of the diversification process without forcing the diversification process to be constant across the entire tree. The first model, which we refer to as “CID-2”, contains four diversification process parameters that account for trait-dependent diversification solely on the two states of an unobserved, hidden trait. In this way, CID-2 contains the same amount of complexity in terms of diversification as a BiSSE model. The second model, which we refer to as “CID-4” contains the same number of diversification parameters as in the general HiSSE model that are linked across four hidden states. In the case of the CID=4 model, we have implemented a separate function, hisse.null4() that should be fairly self-explanatory. However, rather than implementing a separate function for the “CID-2” model, we found it is easier to just set it up and test it using the hisse() function. This section describes how to do this. In other words, we are specifying that both 0A and 1A have one set of diversification rates, and 0B and 1B have another. That’s it. This is the “null-two” model. and the results can be compared against any model in the hisse set, including BiSSE. These are the default colors: red to blue for rate and white to black for state. However, other colors can be specified (see plot.hisse.states manual). The legend in the bottom left corner provides the frequency of the observed states (0 or 1) and the distribution of net diversification rates at the tips only. Note that in this particular model I only specified two diversification rate parameters [i.e., turnover.anc=c(1,1,1,2), and eps.anc=c(1,1,1,1)], and yet there seems to be a continuous range of rates at the tips. What gives? Well, when a single reconstruction is provided the rates painted on each branch are the weighted average of the rate, with the marginal probability used as the weights. So this particular painting has taken into account the uncertainty in rates on each branch. Now the differences completely disappear. 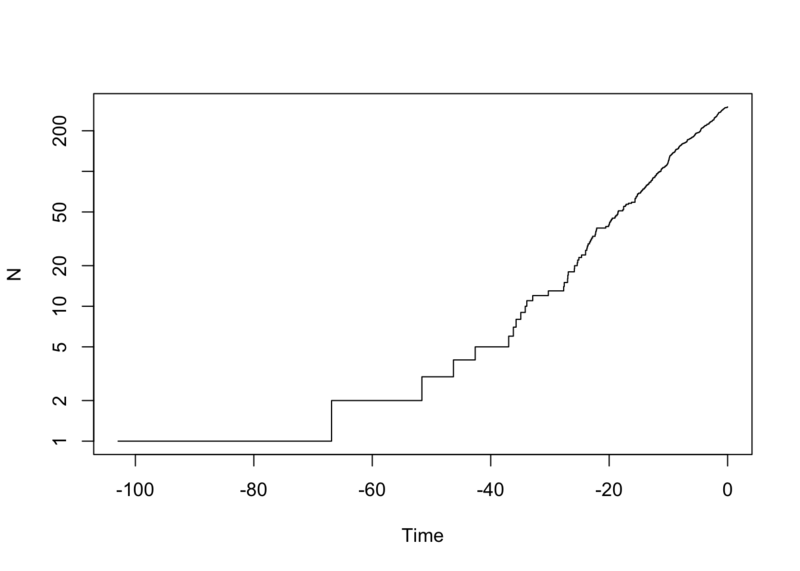 A really cool feature of the plotting function is that if you provide a list of hisse.states objects the function will “model-average” the results. In other words, branches are painted such that they take into account both state and rate uncertainty and uncertainty in the model. The plot.hisse.states() first calculates a weighted average of the likeliest state and rate combination for every node and tip for each model in the set, using the marginal probability as the weights, which are then averaged across all models using the Akaike weights (i.e., the relative probability of a model). Although this is similar to the plot above, which shows no real rate differences, it actually accounts for both the uncertainty in the model as well as the reconstructions. Note that there are many features that can be adjusted in plot.hisse.states(), which is described in detail in the manual.